HY DO SO MANY traditional priests hate the Pius XII revisions to Holy Week? Is it because Holy Saturday and Holy Thursday no longer take place in the morning? Is it because several beautiful melodies at the end of the Passion—as well as much of the Palm Sunday “pre-Mass” ceremony—were suppressed? Is it because the foot washing can now be done during Mass? My suspicion is that none of these things is the answer. To preside, a person must live from the rich ambiguity of symbolic reality. […] At Sunday Eucharist, there is reverence for the Body of Christ when we have eaten bread that is bread to all the senses, and when we habitually have enough wine for the cup to be shared by every communicant. Do not deprive these symbols—bread, wine, eating, drinking—of their power. Our more careful planning helps us avoid taking from the tabernacle hosts consecrated at a previous Mass because we have given thanks over this bread and wine on this altar. […] Doing their symbols, Christians form Christians. Leave aside his erroneous use of language (symbols can be used but not “done”). Leave aside how troubling these directives are from a theological standpoint (the “bread” is no longer bread after Transubstantiation). Similar to the McManus excerpts: consider the emphasis. Suppose Dwight D. Eisenhower, Supreme Commander of the Allied Forces—instead of focusing on defeating Hitler—became fixated on the color of his shoes. Would we not condemn him? Would we not remind Eisenhower that his shoe color is unimportant compared to defeating the Nazi armies? Similarly, is it really such a crime if a Catholic receives the Holy Eucharist consecrated at another Mass? Does that Catholic not receive the Body, Blood, Soul, and Divinity of Jesus Christ, the Second Person of the Blessed Trinity? Could anything else matter? A rigid insistence on the rhythmic theories of Solesmes in all performances of chant was a restrictive element, since most choirmasters had not been trained in it and thus were reluctant to try to teach it. Graduates of the Pius X School taught only the theories of Dom André Mocquereau and Dom Joseph Gajard to their students. These were very French in their approach to the Latin language, and often conflict developed in teaching the chant, especially among groups of German or other ethnic backgrounds. The chant became too precious and difficult to perform because of the theories of interpretation. Too often choirs imitated rather than learned the chants. School children in the Midwest sometimes sounded like members of a French choir instead of the children of immigrants from eastern Europe. Parish choirs found it too difficult to achieve the special effects demanded by the experts, and the result, unfortunately, was a reluctance to use chant, especially in parochial choirs and in congregations. The chant was intended to be the song of the people, but unfortunately it became an art form whose rendition was beyond the abilities of all except the specially trained. Msgr. Schuler’s analysis is incorrect. Preconciliar Catholics had much bigger problems than choirs sounding too French. 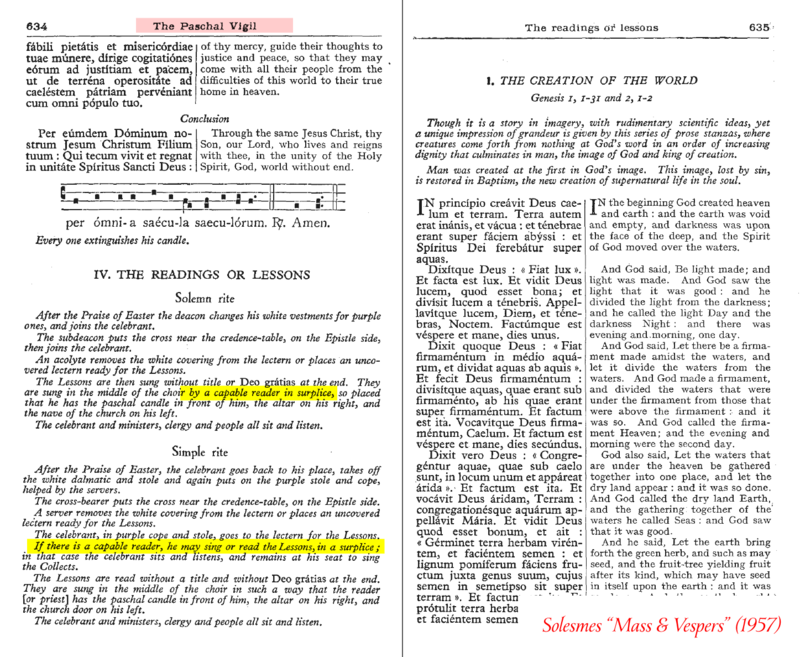 Regarding seeing the big picture, I know many dislike 3 the Pius XII revisions to Holy Week, some of which were optional as of 9 February 1951 (Dominicae Resurrectionis) and all of which became obligatory as of 16 November 1955 (Maxima redemptionis nostrae mysteria). However, I can tell you one thing: our ceremonies yesterday, according to 1962 books, were unbelievably powerful. I was so impressed, too, by the singing by our choir. These are terrible words. How cruel humanity can be! Yet, Jesus Christ died for all, in spite of our horrendous sins. I read your blog article, and I think you misunderstand Msgr. Schuler’s point. What I understand him to say, is that Gregorian chant should be sung by all the people! (Even if a school choir in the midwest sounds like it is comprised of… German immigrants.) But those who were teaching it, held too exacting of a view about it, and demanded too precise of an interpretation of its rendering… thus keeping it only for the “elite” singers who were specially trained. I take his point to be that chant can and should be sung by all of the people… and that minute quibbling about certain details of the singing should be set aside. Rather than setting the bar “too high” for its execution (and hence, not having it sung at all! ), it should be allowed to be sung by all the people, even if there are some minor technical flaws in it’s execution. 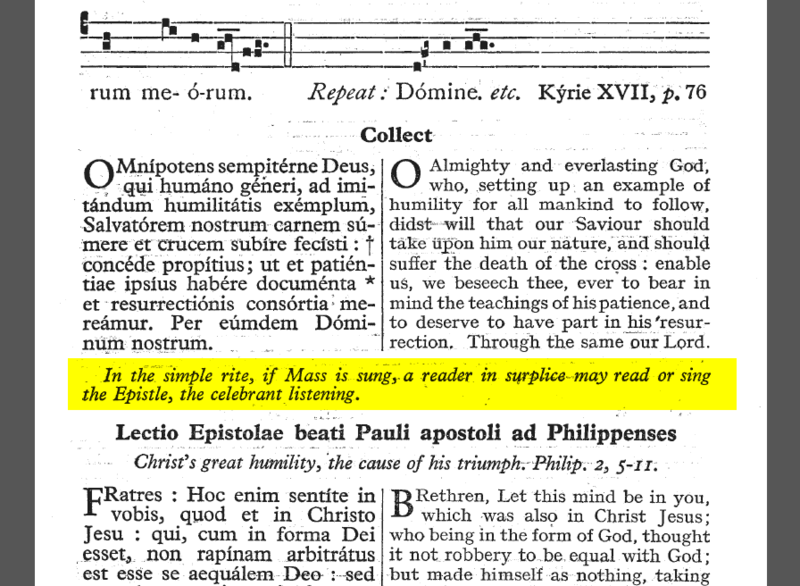 As a lay person totally untrained in the singing of chant, who has been singing it for the past eight years, I agree with Msgr Schuler. Chant can be sung well by people with little training in its execution. It should be the liturgical music for all the people. While academic arguments about certain nuances may have their place in academia, those arguments should not be allowed to become a roadblock to the common people singing chant at Mass. 1 Myself and my brother—neither of us clerics—sang these readings in cassock and surplice during the 1990s at our FSSP parish. 2 Just look at the quote at the bottom of this page. 3 Don’t tell whoever wrote the first sentence of this document!